Though it marked the end of Attack In Black, Years (By One Thousand Fingertips) signalled the start of a musical journey for its individual members that continues today. The first and only time I saw Attack in Black was on October 29th, 2009. It was a whole night of firsts for me actually. It was the first time I ever went to The Mansion, Kingston’s best spot to see bands that were a little bit punk, a little bit popular, but not popular enough to be in heavy radio rotation on the local campus station or otherwise. It’s a place where my band would perform numerous times. We opened for the Cancer Bats there, Monster Truck, and rather comically, Baby Eagle (the joke is we sounded like this and we needed to prove to the promoter ASAP that we could sell tickets so we could open for Every Time I Die. Steven Lambke, from what I remember, did not think it was funny. Shotgun Jimmie told Geoff he was good at drums though. Very cool). It was the first concert I had seen since moving to the Limestone City to attend Queen’s University, an experience I liked, hated, and ultimately accepted. It was the first night I had a beer with the guy who will be the best man at my forthcoming wedding (probably an event I would likely not remember if it were not for this show. He is quite unremarkable). I’m not sure why I hadn’t seen Welland’s favourite sons (all due respect, Jim) before that. It was probably due to some combination of school nights and summer camp, but needless to say I was stoked to see the band that had released one of my favourite albums of my high school years — especially by a Canadian band — 2007’s Marriage. From what I remember, it was a relative hit. Attack in Black were swept up in the Alexisonfire vortex, “Young Leaves” played fairly regularly on MuchMusic and they won two CASBY awards for Favourite New Indie Album and Favourite New Artist. The table was set for the band to be Canadian rock radio staples, a fate that simply would not have done justice to the creativity that each member of the band possessed. They were travelling on a highway that might have lead them to stadiums, but also likely would have led them to synth-pop (in an unlikely twist, Ian Daniel Kehoe has arrived there gloriously and naturally on his new album Secret Republic, review coming soon), gimmicks, and a lifetime of never quite breaking in the States. I don’t know if the band foresaw this bleak future, but to paraphrase their sonic forefather Neil Young, travelling there soon became a bore so Attack in Black headed for the ditch, or more accurately, a field. I heard about the band’s quick follow up (reaction?) to Marriage, The Curve of the Earth in a video interview recorded at the aforementioned CASBY awards. At the time, it barely seemed like it had anything to do with Attack in Black. It is a quiet and reflective record. Made over a few weeks in September of 2007 on a two-input tape recorder in Spencer Burton’s sunroom, the band didn’t even realize they were making another album until two days into recording everything they were writing. It was the exact opposite experience of recording the twice-recorded Marriage. 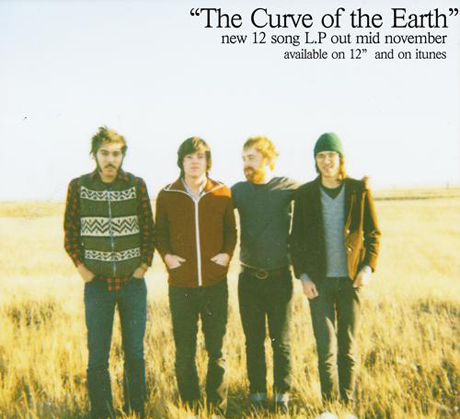 In many ways, The Curve of the Earth was an act of defiance and a clear turning point for the band. They must have realized they were not the kind of artists to work according to other people’s expectations or on their timelines. I imagine at some point their label, Dine Alone Records, must have realized it too, but that didn’t stop them from releasing the band’s third and final masterpiece, Years (By One Thousand Fingertips) ten years ago this month. Years is sort of a happy medium between the band’s two 2007 albums, in that there are are a few nasty guitar tones scattered about, the songs pretty much all have drums on them, but it also has Curve’s decentralized, experimental feel. Once again, deploying hindsight, it is a fascinating, varied, and beautiful record in composition and production that features many of the Attack in Black’s strongest songs. It is a clear maturation from the band’s previous records and endeared them to a whole new group of listeners. At the same time, it likely scared off anyone who wanted more from the version of the band that briefly blew up two years prior. I do wonder how much of the album was pushed to more (any?) Marriage-esque territory by their label. The only song that sort of sounds like it got the “we need a single” treatment is “Liberties”, but this doesn’t seem like a band eager to acquiesce to the pressures of capitalistic enterprises. Then again, they did release it as a single. Coincidentally (or maybe not), Years was released on the same day as You’ve Changed 001, Shotgun Jimmie’s Still Jimmie. Something tells me that, at the very least, everyone involved knew it would be the last proper Attack in Black album released on Dine Alone. Whatever the case, March 10th 2009 is the day Attack in Black crossed over into into the modern era. Prior to the show on that night in October of 2009, I had probably only listened to Years all the way through a handful of times. This band, and its members, moved and grew and then moved on so fast and I hadn’t caught up with them yet. I don’t think I actually caught up until about 2014/15 when I fell for Daniel Romano’s last true-blue country record If I’ve Only One Time Asking. I have been keeping up ever since. The band were incredible that night in Kingston — tight, energetic, and entertaining, even though I don’t think I recognized more than a couple songs (I imagine it sounded something like this). I wasn’t alone. As the end of the set approached, people started to call out for “Young Leaves” and “Come What May” and then, if I remember correctly, although maybe this was just what I was thinking, “anything from Marriage”. The calls were not answered and I remember a strange energy at the end of the show. It wasn’t disappointment, because the band was so good they left no room for that feeling, but maybe it was a sense of finality or the inevitable end. As it turned out, it was the end. A few months later the band posted on a dormant blogspot page that they were working on a new album and a live album. And then, they quietly passed on before we could kill them. I cherish that night at The Mansion, as well as the records the band released during their short existence. Now that I’ve grown up and heard the music made as a result of Attack in Black going their separate ways, I am grateful for and impressed by their decision to call it day. If Curve of the Earth was an act of defiance, Years is a quaint acceptance of the fate that befalls any band that dares to go against the will of their proverbial masters. And if Attack in Black had to die so that the music made by its members in the years since could exist, than what a beautiful death it was.